The referee for our home game with Wigan Athletic on Saturday sees referee Oliver Langford from the West Midlands in the middle. Oliver has his father to thank for him becoming a referee. When Oliver was playing in a youth side, he had a go at the man refereeing them and afterwards his dad gave him a ticking off saying that he should try it. Well he did and worked his way up to becoming an Assistant Referee before progressing to the Referee’s List in 2008. Oliver was last in charge of the Millers for the first game of the season away at Brentford which was a five-one win to the hosts. The time before that was in February 2017 at the New York Stadium in the Championship game against Blackburn Rovers. The game was a one-all draw with Jon Taylor scoring for the hosts but an own goal five minutes from time from Stephen Kelly gave Rovers a point. Earlier that season Oliver was also in charge of our game at Pride Park which Derby County won three-nil. The 2015/16 season saw him in charge of the Millers in January when Brighton and Hove Albion were the visitors to the New York Stadium. A goal in the last minute of the first half from Danny Ward and another from Matt Derbyshire with four minutes to go gave Rotherham a two-nil win. The time before that was in March 2015 when Sheffield Wednesday were at the New York Stadium. Ben Pringle opened the scoring for the hosts on fifty-seven minutes with an equaliser on eighty-six minutes coming from Caolan Lavery. Just a minute later Jordan Bowery, with what was probably his first touch after coming off the bench, put the Millers back in front but just as the Fourth Official put the board up for an extra seven minutes Atdhe Nuhiu got a second equaliser for the Owls. Then, to make matters worse, on the eighth minute of the seven allotted the Millers defence fell to sleep and Kieran Lee hit the winner for the visitors. That afternoon Jack Hunt and Craig Morgan was booked for the Millers plus Owls players Joe Mattock and Sam Hutchinson. October 2013 saw Oliver in the middle for our one-nil win over Brentford at Griffin Park. Mark Bradley scored the Millers goal on fourteen minutes with Mr Oliver deeming to book six Millers players – Bradley, Lee Frecklington, Rob Milsom, Ben Pringle, Alex Revell and Kieran Agard – and Alan McCormack from the Bees. On Easter Monday of that same year Oliver took charge of our game at the Priestfield Stadium which saw Deon Burton score the only goal of the game for Gillingham. That same season he was also in the middle for our game away at Exeter on a very, very wet Saturday afternoon. Once again it was one-nil but this time to the Millers with Ian Sharps scoring three minutes before half-time. With just a few minutes left of the game Mitch Rose came on for Daniel Nardiello. Within minutes of him coming on he went in with a bit of a rash challenge which the water on the pitch took him sliding into his opponent with Mr Langford showing the youngster a straight red card. On 30 December 2011 the Millers travelled to Cheltenham where Mr Langford was the man with the whistle. A Marlon Pack goal on eleven minutes gave the hosts all three points with yellow cards being shown to Dale Tonge, Michael Raynes and Danny Harrison of Rotherham and Towns’ Russell Penn. Easter Monday and Gillingham again in 2011 saw Oliver take charge of our game at Don Valley and once again it was a one-nil win for the Gills with Andy Barcham scoring in the last ten minutes of the game. The 2009/10 season saw Oliver in the middle for our game at the Sixfields which saw Ronnie Moore return as Manager. It wasn’t a happy return as Northampton won the game three-one. Goals from Ryan Gilligan and Courtney Herbert plus an own goal from Ian Sharps saw the hosts go into a three-nil lead with Adam Le Fondre pulling one back from the penalty spot on seventy-nine minutes. The first time Oliver was in charge of a Millers game was in October 2008 when the Millers travelled to Gigg Lane to take on Bury. Reuben Reid and Drewe Broughton put the visitor’s two-up in the opening eleven minutes with Paul Scott scoring, what turned out to be a consolation goal, for Bury on the half-hour mark. Pablo Mills and Richie Barker were the only players to see yellow that day. In the twenty-five games he has been in the middle for this season Oliver has shown seventy-nine yellow cards and five red cards, one of those being to former Miller Mitch Rose who was playing for Grimsby Town. 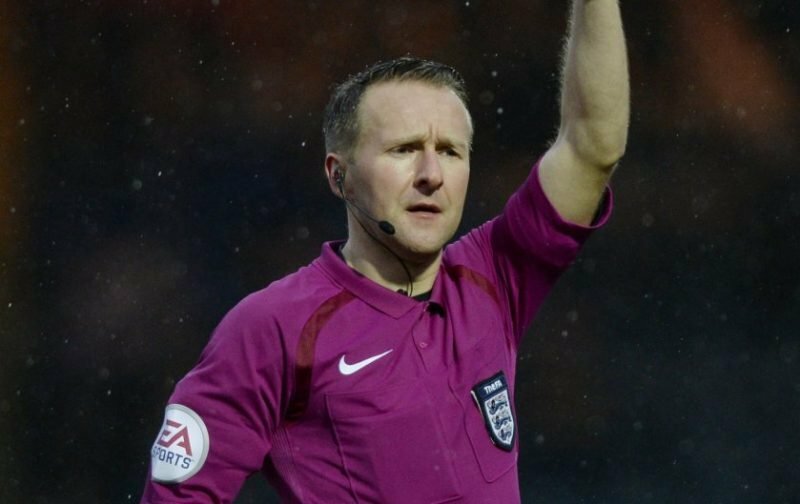 Running the line on Saturday we have Adam Crysell and Robert Hyde with Jonathan Hunt is the Fourth Official.